Kathy’s bookmark. No surprise. Kathy paints rich, gorgeous canvases and teaches art. Bookmark before talented coloring happens. …gets 45 minutes of focused quiet, or learns about making decisions and preparing to win or lose. 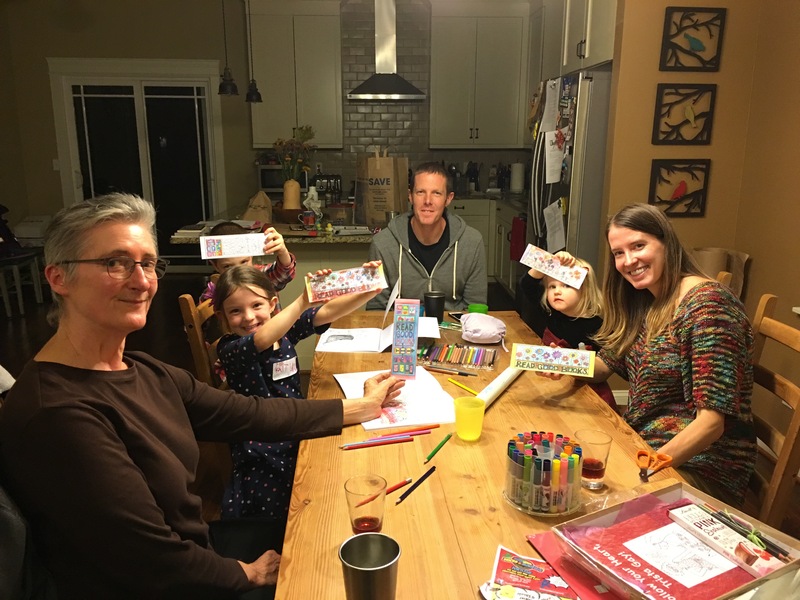 After the launch party, one family was so excited to color they stopped to buy colored pencils then went straight to their dining room table and colored together for 45 minutes. 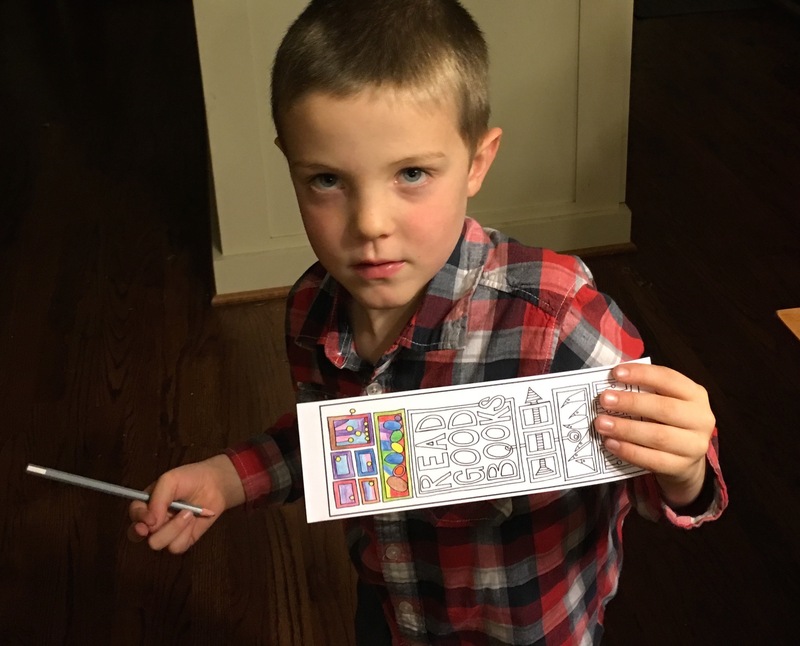 Try to enlarge the picture of C., the little boy, holding his bookmark–it’s meticulous! His mom told me that for the words “Read Good Books,” he’s thinking of animals whose names start with each letter (R = racoon, E = eagle) and then coloring the letter the same color as the animal. Future engineer here maybe? Thank you to Gary Speich for these photos! I also got to see C.’s first page from “Sometimes…” where the whale swims down the street, and C. made the rooftops rainbow! I never would have imagined something so brilliant!! 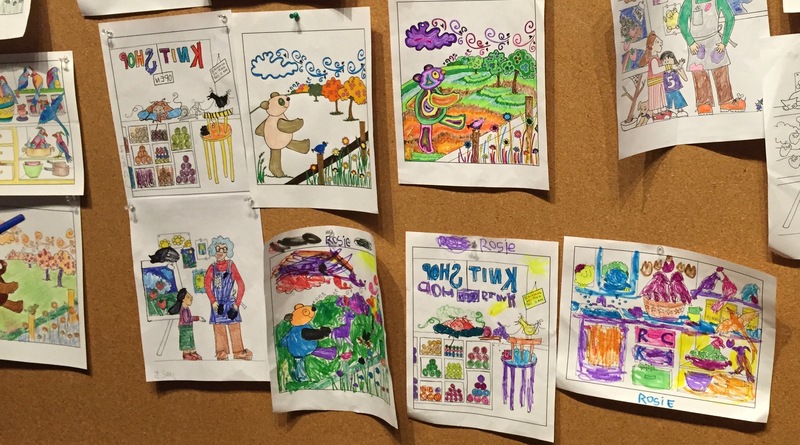 Then, there’s the family whose evening coloring time paid off … literally. 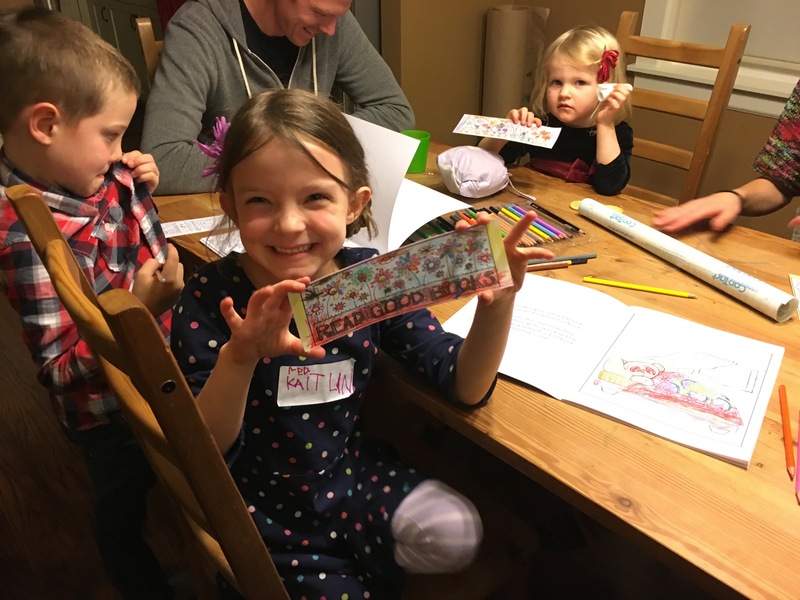 Josh, Katie, and Rosie colored together in the evenings at the dining room table. They talked about each of their decisions to choose certain colors or add things to their pages and inspired each other to be creative. I also heard that Rosie was very, very, VERY much hoping to win a prize at the launch party. I fretted … what if she doesn’t win? I knew her parents had talked through this possibility with her, but I couldn’t stand the idea of her being disappointed — she’s been one of my biggest supporters, and she’s only 5.5 years old! I learned later from Katie that at this point, Rosie was sniffling and trying not to cry that she hadn’t won anything. But, three awards later, the second-to-last award was announced, “Most Charming: we want to wrap this one up in a bow and keep it like a pet” went to … you guessed it … Rosie!!!! You see why I asked five people to be impartial judges. Such effort and talent and time went into coloring these pages. I knew I could never make a decision. Little did I know an entire family would each win an award on their own individual merit. Kind of a perfect storybook ending, don’t you think? 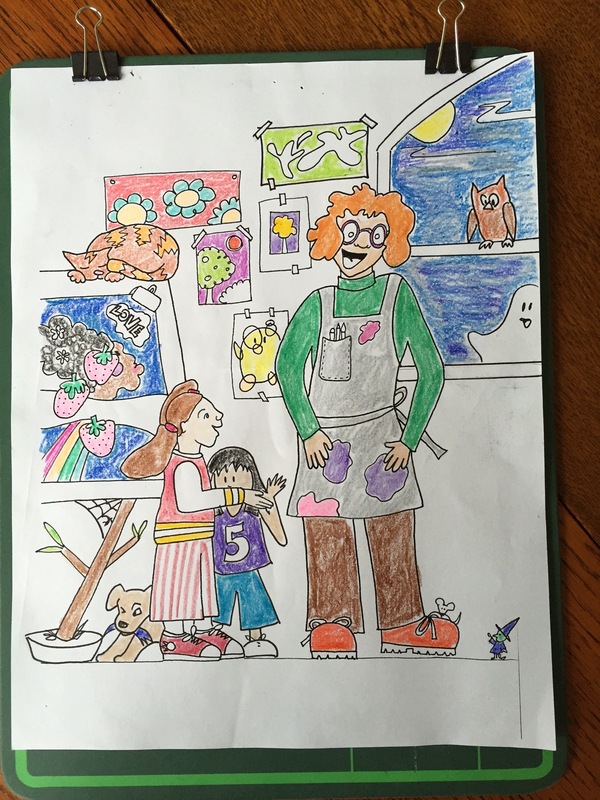 Some day, I’d like to invite a group of all ages to color one afternoon. We’d color the same page, from the same story, then hang them up on the wall and look at all the differences. I love that the reader of these storybooks makes each book totally unique by coloring it their own way, using their own interpretation, and their own preferences. No story ends up the same once colored. This makes me infinitely happy! Look at everything Akira added to my original: a dog, a little girl in a #5 jersey, a witch, an owl and ghost, an extra painting on the wall, and one painting turned into a little chicken! Oh, and a mouse! I’m stunned by this page!!! Akira’s drawings blend so smoothly with mine that it looks like these additions were there all along. What am I going to do about this? 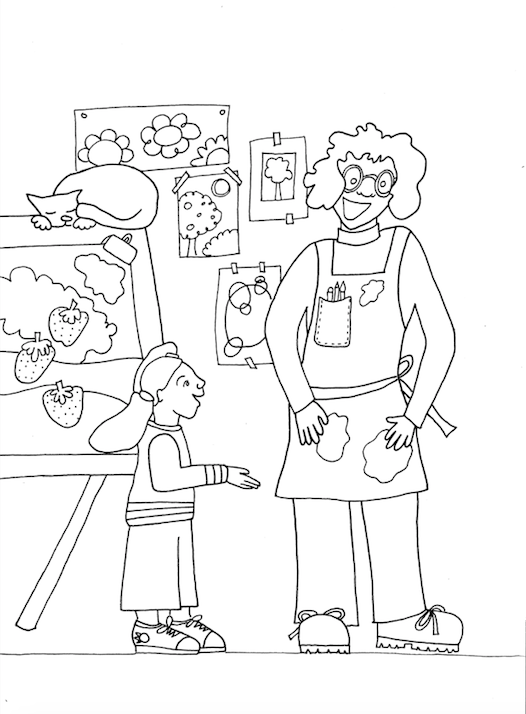 I’m thinking of contacting Akira to see if she wants to collaborate with me on a new storybook you can color. A good idea, no? Okay, stay tuned. 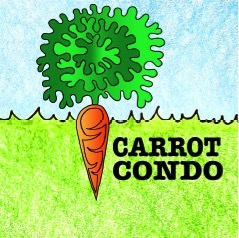 I’ll post the first four categories and winning entries next. And then, there’s a great story that goes with the final three winners. Plus, more pictures from during and after the launch party.